Ready to take your Praxis Elementary Education test? Are you sure? You may need to think again. Blogs and teacher forums are full of candidates cannot pass the Praxis Elementary Education tests and start their careers. That is, even after weeks (or even months) of Praxis exam practice. Many of them beg for help because they’ve failed the exams multiple times. Why? These Elementary Education exams may be basic, but they’re not easy! Remember: this is YOUR only chance to pass the first time. Do that with these 5 Tips to Pass the Praxis Elementary Education! The number 1 tip is to realize WHAT you need to study to pass your Elementary Education exams. 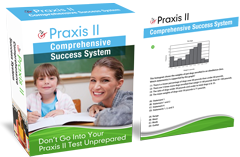 Great Praxis Elementary Education practice tests and study guides help you know WHAT to study! Choose them based upon the test you’re required to take. The ETS website has a PDF study companion that gives a breakdown of the percentage of questions in each subject for each test. It also gives you the framework for the test so you can see WHAT will be on each test. The Praxis Elementary Education study guide or practice test you choose should be based on YOUR test’s current framework. The tests are revised at times, so make sure any test prep material is up to date and matches YOUR test’s content. By studying what’s on YOUR test, you improve your chances of passing your Elementary Education exam. The number 2 tip is to realize HOW you need to study. Whether frustrated teacher candidates have failed the Praxis 1 time or 7 times, they all want to pass next time. They ask their peers HOW to pass: “I always had a hard time taking tests. Any suggestions on what else I can do?” What do their peers say? Purchase the right study materials! You can skip the failure. Study the smart way to pass the Praxis Elementary Education the first time. As you take the Praxis Elementary Education practice tests, mark the questions that take longer. Then look closer at those question. What do they have in common? Analyze the answers, even if you chose the correct answer: look for patterns in questions and answers to find the words, phrases, or types of questions that “trick” you. If you have “always had trouble taking tests”, maybe YOU need to invest time in learning HOW to take the test! The number 3 tip is to realize WHEN you need to study. This tip is based on new research on taking high-stakes tests. Use it to pass your Elementary Education Praxis ! The number 4 tip is to realize WHERE you need to study. You know that part of your job as a teacher is to teach students how to learn. Part of that is teaching them to study. But do YOU know the best Praxis Elementary Education study tips? The best test-prep materials will tell you to study in a place that is just like the testing place. Is it free from other distractions? Is there a way to time yourself during practice tests? Make your study place LIKE the testing center. Don’t make the Praxis harder than it already is! The number 5 tip is to realize WHY you need to use a study guide or practice questions. Still not convinced you need help? These two comments echo so many disappointed teacher candidates! Use their failures to motivate YOU to succeed! So, the ETS tries to help ease the pain of failure by showing you how to pass next time. You DON’T need to improve your score if you pass the first time! Choose a Praxis Elementary Education practice exam or book that can help you to pass! Then follow the Top 5 Tips to pass the test the 1st time! After all the work you’ve done to teach, don’t let the Praxis stand in your way! Start studying for success NOW!